Oil-Electric: Sue, the Stewardess - Nurse! Northern Pacific 6511, Auburn Washington, May 27, 1961. The Electro Motive Division power pack chants quietly at East Auburn, anticipating her eastward journey. Her EMD's sound deceptively friendly at idle speed. She’s taken on most of her passengers up in Seattle, but on the other side of the train, the excitement of boarding a transcontinental train is palpable, as a flurry of activity at the final Puget Sound loading is completed. The North Coast Limited began as a summer tourist operation in Aril 1900, and in response to its popularity went “full time” in 1902. During the zenith years – 1952 to 1970 - this train was rated in the top tier of Streamliner service in the USA. Featuring roller bearing wheel sets, brass windows, valet services, a barbershop, separate bath and shower facilities for men and women, a soda fountain and radios on-board. Tables in the dining car were set with fresh flowers and linen table cloths. Raymond Lowey was engaged to improve the image, and in 1954, the dome cars were added, and the train renamed the Vista Dome North Coast Limited. The luxury train featured a visually stunning two tone color scheme, interiors representing the Lewis and Clark Journey of Discovery, and a full service train crew which included a registered nurse. I remember well the advertising slogan for “Sue, the Stewardess – Nurse!”, a wonder-woman who was on board to help families navigate their cross country adventure. I never had the need to ride one of these trains, but it must have been a magnificant adventure, fueled by the competition for the travelers dollars between the Great Northern, Northern Pacific, Chicago, Milwaukee, St. Paul & Pacific, Western Pacific, Union Pacific, and Southern Pacific. 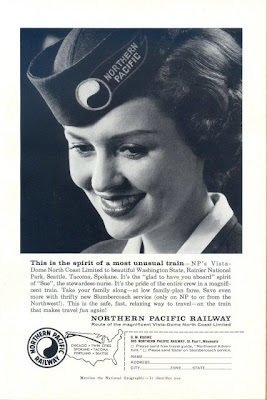 As a matter of fact, it was the Union Pacific who raised the bar on customer service by introducing the concept of including a nurse on the passenger train staff back in 1935! The Western Pacific had had the Zephyrettes. Enter AMTRAK. The magnificent Raymond Lowey paint scheme of 1953 gave way to the totally ugly Cascade Green under Burlington Northern ownership, represented here by renumbered NP 6014A, and yet another ugly scheme, represented here by sister NP 6511C - AMTRAK 105. So. Loading at East Auburn has been completed, and that fellow standing on the platform, will get the hand off from the conductor, and slip the throttles forward. Those magnificent V-16’s will work up to Run 8, and a whole new ambiance will take over, as they immediately lean into a grade up out of the White River Valley! Railroad Stuff: Northern Pacific 6511A, General Motors F-7A, 1,500 hp, built EMD La Grange, 1949, sn: 8736. After “the merger” renumbered BN 9780, renumbered AMTRAK 104 in 1972. Retired 5/75, traded for FP40. Scrapped by Pielet Bros.
And, if you’d love to run this locomotive, it is available to you as Modelpower Metaltrain #104!